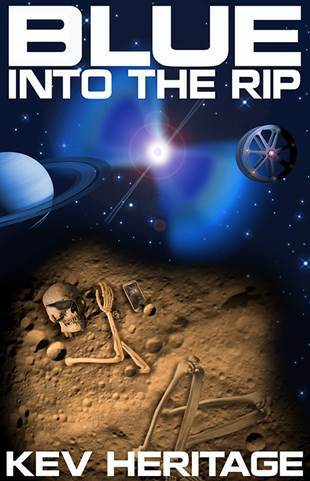 Kev Heritage is the author of Blue Into The Rip, an inventive and fun blend of genres that I had a hard time putting down (see my review). 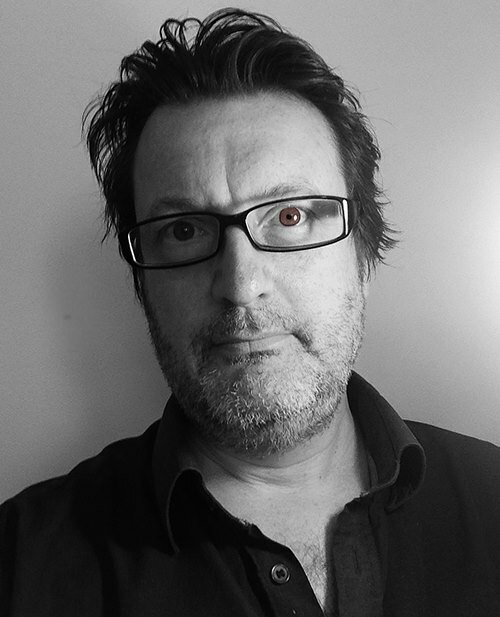 Kev calls himself “A two metre biped from the genus Homo-Sapiens” but don’t be fooled by that small bit of modesty. As his bio attests, he’s done more things in more places than most everyone else, and has had a fair bit of success as a writer. I expect after more readers get their hands on Blue Into The Rip, his debut novel, that ‘fair bit’ of success will become “amazingly large.’ I asked Kev to answer a few questions about his book, which you can get for FREE (see below for details). The premise is so unique and fresh, blending elements of Young Adult, Dystopian, Time Travel and Eco-Awareness; where did you get the idea for Blue Into The Rip? I was flipping through a notebook (years old) to see if I’d come up with any good ideas (I hadn’t), but scribbled at the top of one page were the peculiar words: Blue Into The Rip. I have no idea what I was thinking when I wrote that phrase, yet it stuck in my mind. I started to wonder what it could mean. Blue became a character name and The Rip some kind of tear in the fabric of time and space. The story sort of jumped out from there. Was it your intention to do a series or did the idea spring to mind during or after writing? As soon as I discovered Blue was the result of genetic experimentation, the back story leapt fully formed into my mind and I knew it would take more than one novel to tell that story, so the series was born. On top of that, I loved all the characters I met in the novel and I wanted to see what happened to them next. The idea for book two: Blue Into The Planet arrived almost simultaneously. The series will consist of self-contained novels with a developing backstory – as with Blue Into The Rip. Although very much an exciting adventure story, there are some very serious issues running through Blue Into the Rip, like Global Warming and genetic manipulation. Are these issues you’re passionate about? Global Warming: I have both a practical and emotional view regarding global warming. Whatever we do now or in the future, the Earth will continue pretty much as it always has done. It has already successfully come back from meteor impacts, ice-ages and devastating volcanic activity etc. many times over. There is no doubt it will also survive global warming. This world of ours is a tough customer – anything we do will be an insignificant blip in its five billion year lifetime. So let’s get over ourselves and realise that we will have little long-term effect on the planet. For now though, Earth is home to the human race and a quite astounding range of animal and plant life – a sublime and beautiful place. Whatever the cause of climate change (although the overwhelming scientific evidence points towards us humans), we need to do something today – to slow down, halt and reverse this process. We have a responsibility to look after what I like to call ‘Our Very Earth’. If we do not, the evidence suggests that global warming will have a direct and devastating effect on the lifetimes of people who may already be alive today. Having said that, I’m a firm believer that for humans to survive, we have to leave Planet Earth and create more manageable space habitats to dwell in…but that’s a whole other story! Eugenics: A sticky issue if there ever was one. Should we, for instance, screen out our bad genes to make sure we don’t pass on nasty diseases like cancer or Huntington’s Chorea to our off-spring? Yes, I think we should. Should we add genes such as those for intelligence, disease resistance and better memory? Maybe. But here’s the problem: Where will we stop? How soon before we start screening out racial traits, certain types of personality types or even homosexuality? How soon before we would be making everyone blonde-haired and blue-eyed? Not to fit to Hitler’s Aryan ideal, but to simply pander to trends of beauty and social acceptability. The technology to make these choices possible is just around the corner. As a result, I am very interested in the profound effect this science will have on humans as a future species. Without spoiling any part of the plot, was there a particular scene you enjoyed writing more than the others? One that gave you trouble? I see the novel as an entire thing. Every chapter, every scene and every sentence needs to be as equally good as all the others, so I don’t have any favourites per se. Having said that, I do like writing ‘cliffhangers’. My favourite cliffhanger comes at the end of the chapter called ‘The Blue Eyes’. I’m very proud of that one. The way I write leads to situations where I lose confidence in the project as a whole. But that’s not all. I lose confidence in my writing and myself. I become bogged down by the plot or lack of one! I can’t count the times I thought this novel was an irretrievable mess and that I’m just not a writer. And that’s an awful feeling. But these feelings are imposters. It’s part of the irritating process for all my writing. A regular crisis of confidence I’ve learned to ignore…mostly, heh. So it’s head down and slog on through. My favourite characters? I like them all. It’s a bit of a writers’ cliché to say this, but they wrote the novel for me. I had the most fun with Hermans, a seven-foot tall verbose Ganymedian whose peculiar way of speaking was a joy (and a laugh) to write. But it’s difficult to choose. They all have their moments…and none of them are safe! When writing are you a planner or a pantser? As in, do you outline plots in advance or use a seat-of-the-pants approach? If the former, how in-depth are your plans; if the latter, what do you use as a starting point: a character, a scene, a setting? Pantser all the way. I have no firm ideas about plot or characters. I put pen to paper (or fingertips to plastic) and we’re off! With Blue Into The Rip, I knew Blue would be transported to the future, meet some cadets, visit a flooded London, live under the remains of the Amazon Rainforest and visit a spacestation with the story ending with him floating over the Rings of Saturn (although I had no idea why, I just thought it’d be cool) and that was it. I cannot write any other way. Believe me, I’ve tried, but any kind of planning kills my writing. I wish it were not like this because I can spend weeks stuck in plot cul-de-sacs with no idea how to continue. But I wake up one day and blam! – there’s the answer…Mostly. You’ve lived all over the world, done a bunch of different jobs. Where was your favorite place to live and why, favorite job and why. Least favorites & why too, please. I feel like I lived so many lives – all vastly different from one another – I couldn’t possibly choose just one. They are all as lovely as each other. However, I have a soft spot for the Greek island of Santorini where all this writing malarkey started. On the beach in Perissa. At sunrise. I think it was a Thursday. 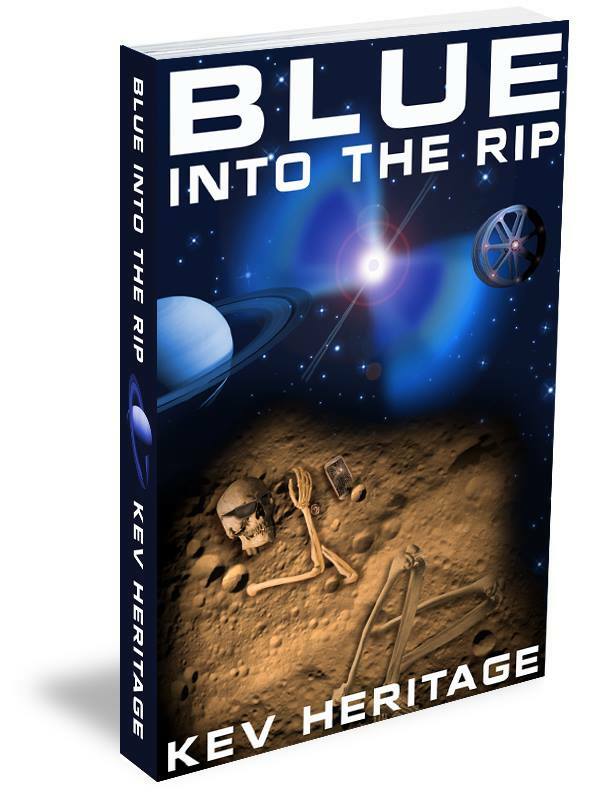 I would also like to offer 20 free e-editions of Blue Into The Rip to the first 20 of your readers to contact me on this email: (fill in the gaps) goforit at kev heritage dot com. Put “40 West Media” in the subject line. This entry was posted in Book Reviews, Reading. Bookmark the permalink. The go for it at Heritage email address is invalid and therefore I cannot send email for the book giveaway.